This has been such a great week…adding new stamps, dies and INKS to the shop as well as scrambling around getting ready for our trip to the UK. It's been fun…but a little crazy, too. Randall and I head out tonight for London and Sunday and Monday, you'll see me on Create and Craft TV. Watch our Facebook page and Instagram for updates and show times. Also, to really make sure you are in the loop, head over here to grab our Color Combination Download and be added to our newsletter list! The first card today has a fun stamped border with All That Jazz, Be Mine, Melon Ice and Grape Crush. I stamped the “Thank you so much” on a white card layer, cut up to the edge of the stamped image with my paper cutter, then used a pair of sharp scissors to cut around the circle. I added a small black border and dimensional adhesive to the back of this card. The next card was made on Facebook Live – click here to view it! I used more of that BFF Background stamped paper that was hanging out on my desk to accent the sentiment and flowers from A Note of Thanks Stamp Set. The butterfly was left over from when I made this card on YouTube Live. Don't you LOVE when you have pieces of this and pieces of that on your desk that you can incorporate into a card? 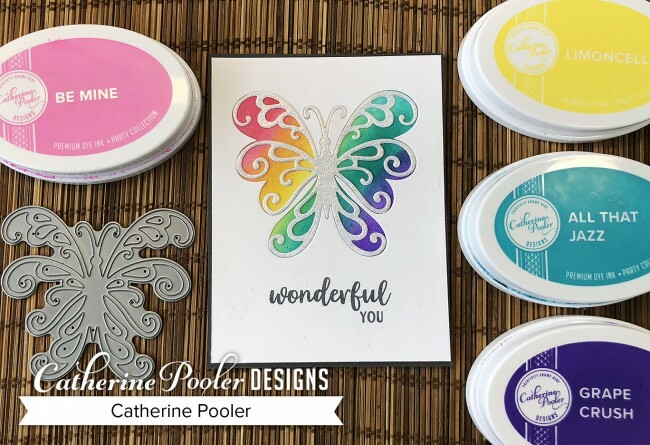 Here is that card I made and had the left over butterfly….can you believe this rainbow was made from just the four ink colors in the Carnivale Collection? They blend beautifully together and make amazing colors when they blend. That butterfly embossed with Wanderlust Embossing Glitter…well, I'm just smitten with it! COMMENT TO WIN: Leave a comment to let us know what other four colors you are hoping will round out the Carnivale Collection later this year. Catherine Pooler – you are here! Jenny Colacicco – go here next!